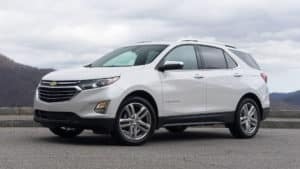 Chevrolet Equinox is the small SUV that’s big on features and big on fun. Ressler Motors has the SUV to fit your needs and lifestyle. Located in Bozeman, Montana, Ressler Motors is the place to find your new joyride today. In the winter, you don’t want to take off your gloves to get your keys out of your purse or pocket to unlock your car. With the Chevy Equinox, you don’t have to. The Equinox is loaded with the Intelligent Access feature which allows you to unlock your car by pulling on the door handle when the key is sensed by the car. You can still leave your key in your purse or pocket with push-button ignition, just press the brake and push the button and off you go. If your hands are full and you need to open your truck, this is normally an issue, but not anymore. Equinox offers a hands-free, foot-activated liftgate. With just a kick of your foot, the tailgate will open providing hands-free access to the trunk. Having trouble keeping the kids entertained? This is not an issue in the Equinox. With the Chevrolet Infotainment System, you are able to seamlessly connect up to seven devices to a personal 4G LTE wireless network. This allows you to stay connected wherever you may roam. The Chevrolet Infotainment System does not end there. Connect your phone via Apple Carplay or Android Auto, and have all of your phone’s features at the push of a steering wheel button, keeping your eyes on the road, and stay safely connected while driving. No matter why you need a new car, Ressler Motors is here to get you on the road in the Chevy that is right for you! Cruise on down to Bozeman to find the Equinox that will keep you moving on to your next adventure today.